I wish that I could write about some ground breaking technique involving the making of chairs. Some new way of making this bit or that. Or maybe a new method of work holding that would be a game changer for chair makers the world over. 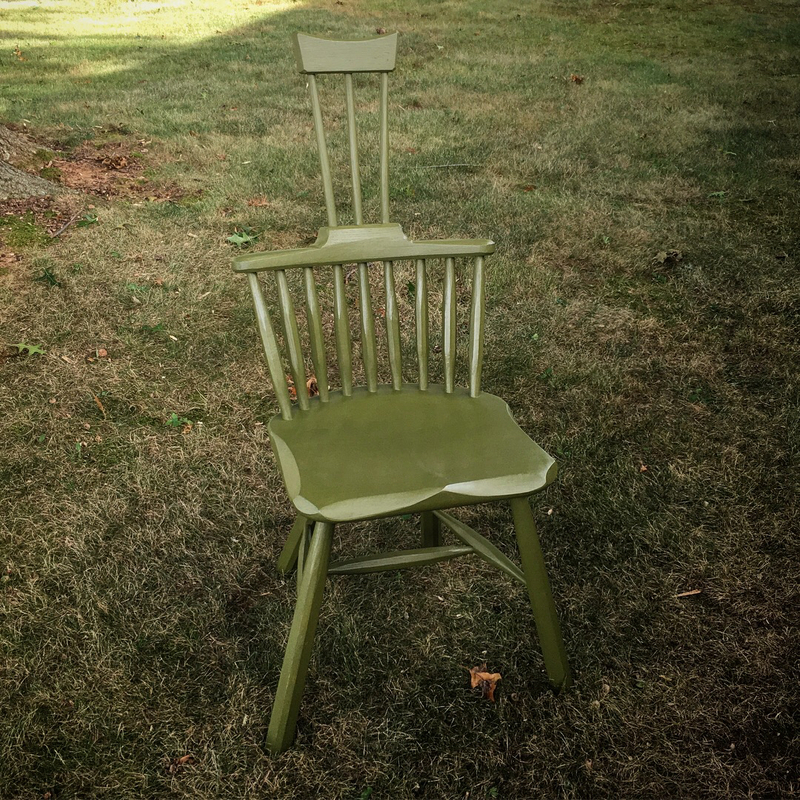 The simple truth is, that all of the information you need to build a chair is already out there. The stumbling block seems to be a psychological one for the vast majority. Granted, my chairs are of the vernacular, folksy and rustic variety, but the concepts hold true for all chairs. Also, it takes a surprisingly small tool kit. With an assortment of less than ten tools I can build a chair. Even less if I was to forgo the saddling of the seat. (Flat seats are common in antique stick chairs). No specialized work bench, no fancy jigs, no lasers or black magic alchemy is involved. Just a few tools, some straight grained wood and, most importantly, a willingness to completely fail. Complete failure is exceedingly rare, but I think the fear of it is what holds most back. I know it was a factor for me, but those days are behind me. 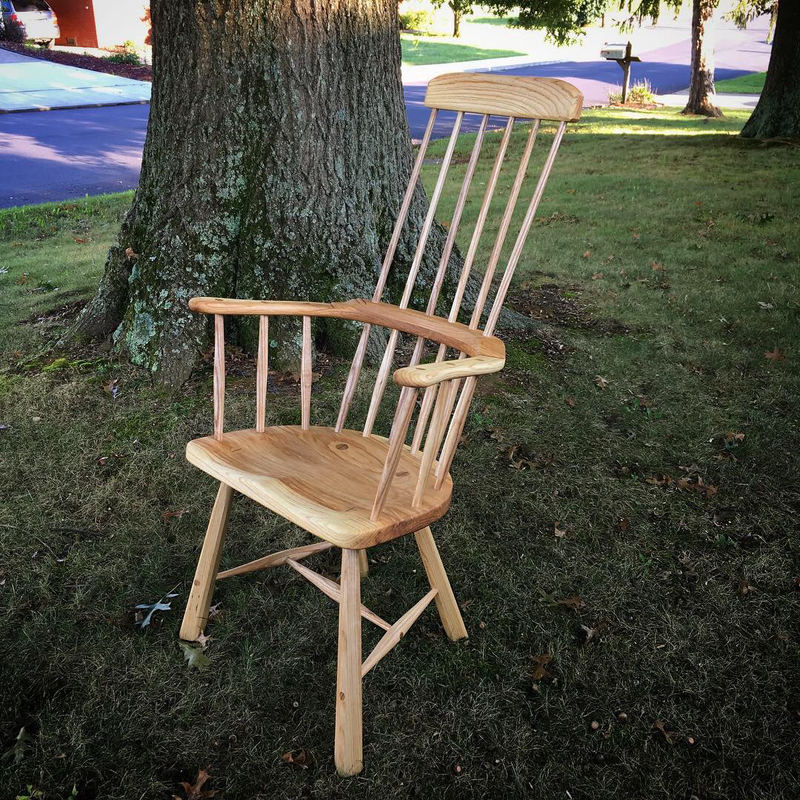 Anyhow, I completed the chair that I showed at the end of my last post. 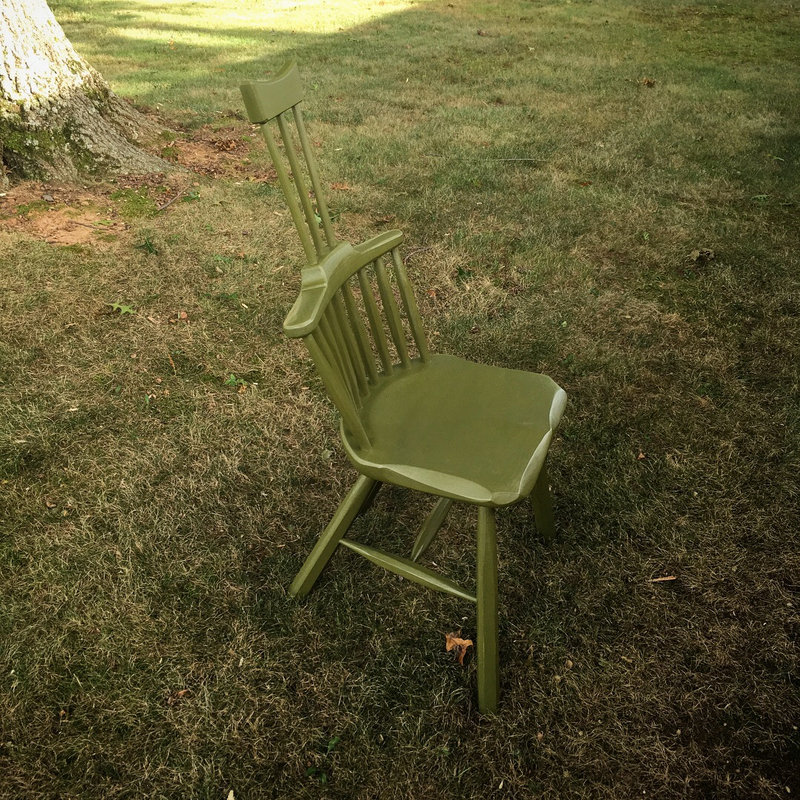 Finished with Bayberry Green milk paint, linseed oil and beeswax. Then promptly began work on another Welsh style stick chair with a three piece armbow and a high back. This one is all ash with a finish on linseed oil and beeswax. 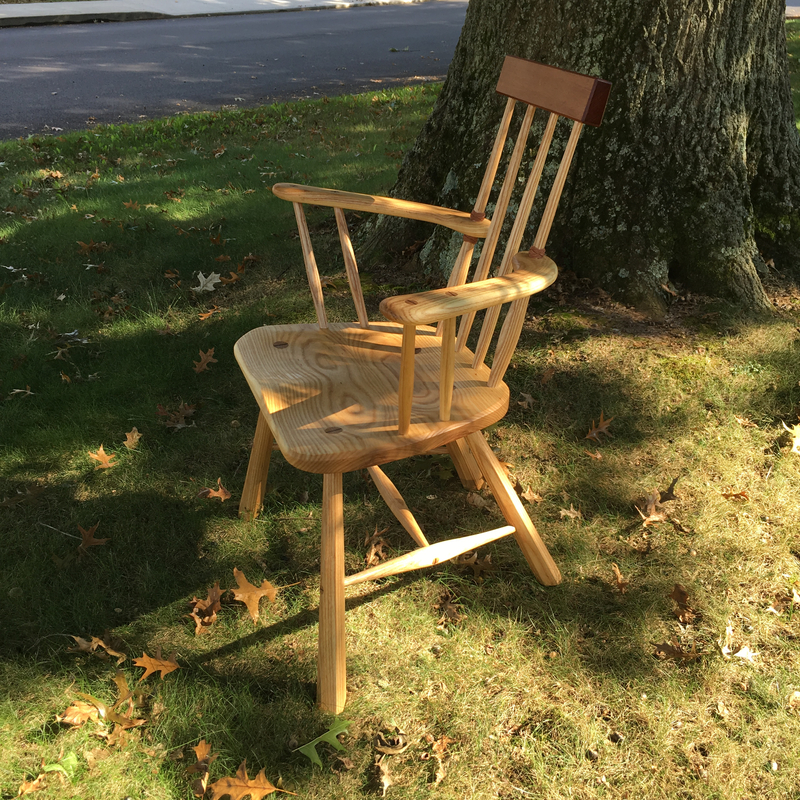 While I like the three piece armbow, I wanted to build a chair with arms that utilized what could be found in the grain of the wood. In the past, folks would have looked for pieces that were naturally curved. 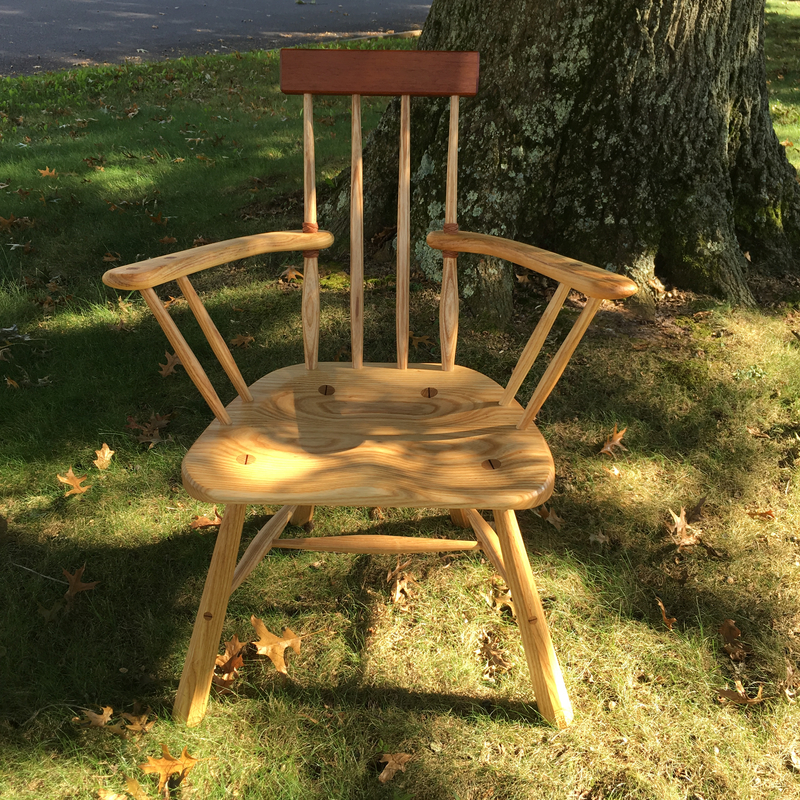 Steam bending was a more specialized task that most “country” chair builders did not utilize. However, I’m using sawn stock and simply looked for pieces that had naturally curved grain that grew around flaws or branches. I’m making no effort to force the shape with a pattern. Instead, I’m using whatever shape presents and building the chair around that. In theory, this should produce the strongest arm (continuous grain) possible. It also keeps the chairs unique. Additionally, by deriving my arm pieces from 8/4 stock I can generate book matched arms. 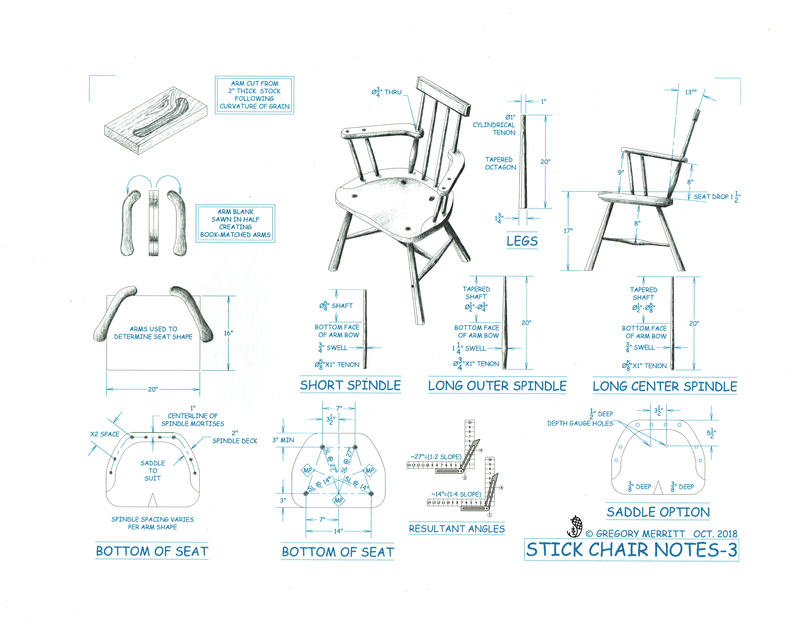 I put together an illustration that details the loose design of this chair. The undercarriage is predominately Welsh with the top drawing on the Irish Hedge (Gibson, Famine) chairs that I’ve seen examples of. I like the resulting process and ultimate completed form that is generated from building this way. Still rustic and unique, but with a set flow of operations that lends to building/designing on the fly. All ash save the mahogany comb/crest rail. 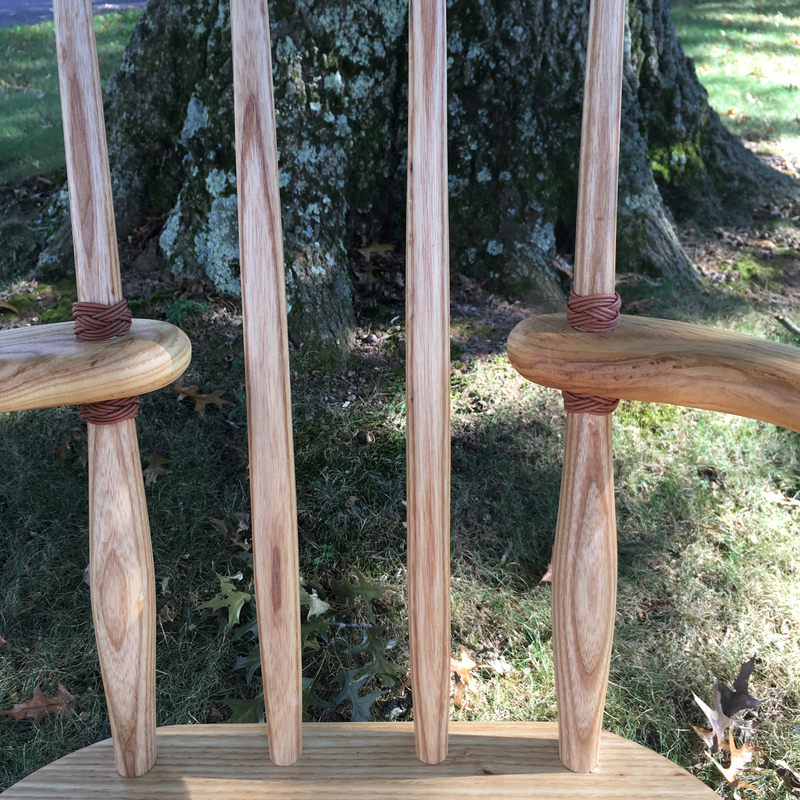 Finished with linseed oil and beeswax. I also managed to work in a bit of knot tying. I have already began working on my next chair and it will be based on this latest design. The chair won’t be exactly the same, but very similar. Management has been complaining that none of the chairs match. Maybe she will be satisfied with similar. We shall see. I hope that, in some small way, I have nudged you towards building your first chair. It is a very rewarding project. 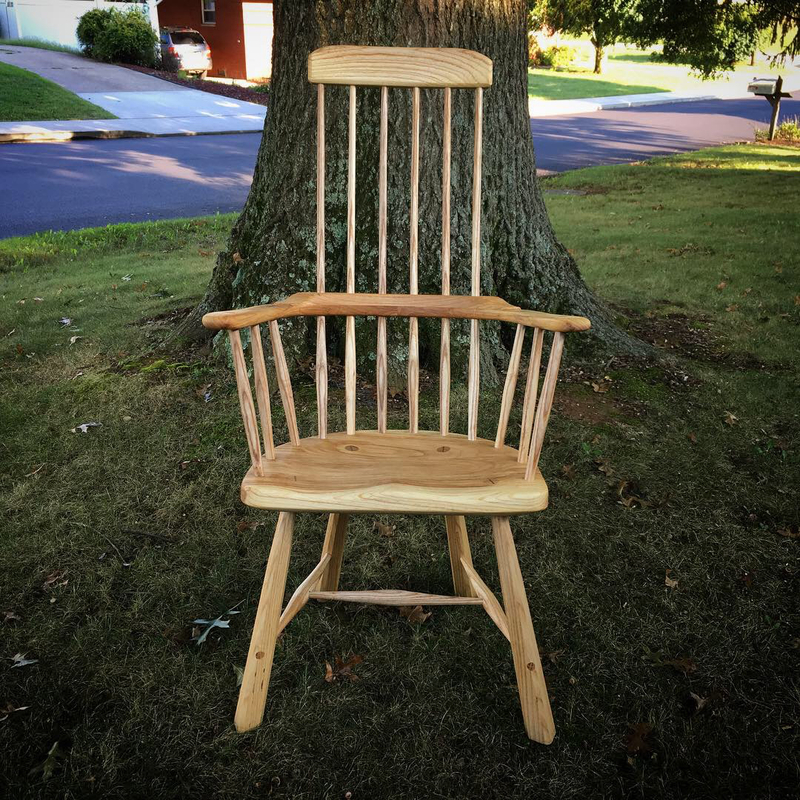 This entry was posted in Design, Finishing, Illustrating, Stick Chairs and tagged beeswax, chair making, irish hedge chair, linseed oil, welsh stick chair. Bookmark the permalink. I particularly like the high back with the three piece arm bow. Thank you! I’m pretty happy with how that one turned out. Nice! I really like the knot tying detail. And also the green paint is really cool. Thanks Brian! It took me a few tries to figure out how to work some knot tying into a chair, but I think this lends a decorative element. Using the term “decorative” fairly loosely. ;). The green is OK, but just a bit too olive drab for my liking. Nice to see you back in fact, I was thinking about you today. The chair looks really good. Hey Salko, thanks. I’m still in the shop most evenings. The blog is starting to wind down. Not much new to add these days. Very nice variations on a theme. As always, your blog is a pleasure to read. How comfortable is the chair to sit in?